Notre Dame may play Stanford in China in 2013 The New York Times has reported. The Chinese game would be the first ever American football event in the world's most populated country and would represent a massive breakthrough for the Fighting Irish. With Notre Dame due to go to Dublin in 2012 it would mean a second successive away game for the Fighting Irish in another country. It certainly would represent a major step forward for college football and open up a potentially lucrative tie with China. Colleges are competing against each other to open campuses in China and the success of a football game there could be huge for The Fighting Irish. Stanford already has deep links to Asia and the fixture in China would make perfect sense to them as well. At least Andrew Luck won't be around then to bedevil the Irish. Other good news for the Irish was that Manti Te'o will return for his senior year. Te'o was calculated to be the 13th pick in the first round of the NFL draft and it was widely expected the Hawaiian would skip his senior year. 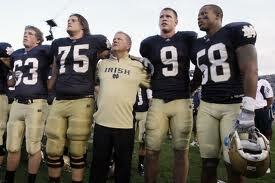 However, like Michael Floyd, he has agreed to stay for his senior year, which is a massive break for coach Brian Kelly. But tight end Tyler Eifert may be on his way to the draft. He has requested that his draft chances be assessed which is rather a surprising move. Eifert could could hardly expect to be an early round draft pick given his limited one year in the spotlight.